Here is the normal appearance of a benign reactive lymph node. 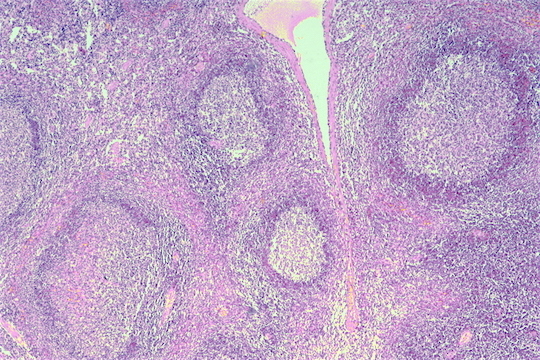 Lymphatics that drain tissues peripheral to the node enter the subcapsular sinus and lymph percolates around and into lymphoid follicles of variable size and having a surrounding mantle zone that is surrounding a pale germinal center in which the immune responses are often generated with a predominance of B cells. Sinusoids extend to the center of the node.